Each disc-based Final Fantasy has pushed the limits of consoles in terms of cinematic presentation and the artistic representation of vast worlds with intricately designed inhabitants. Even though it now shares space with such artistic powerhouses as Uncharted 2 and Mass Effect 2, Final Fantasy XIII upholds the series tradition of possessing generation-defining graphics. Its beautiful in-game engine compares favorably to pre-rendered video in most other games, and its cutscenes have the sparkling clarity and frenetic action of a Wachowski-directed Pixar film. While the game's story is typically obtuse, the world in which it unfolds is full of life that is at once foreign to us and natural in its context: there is enough outlandish machinery and mythical fauna to rival the Star Wars films in terms of sheer variety, but it all seems to adhere to a certain, foreign logic. Even the small details like animated menu transitions or text layout speak to painstaking craftsmanship designed to draw the player further into another universe. 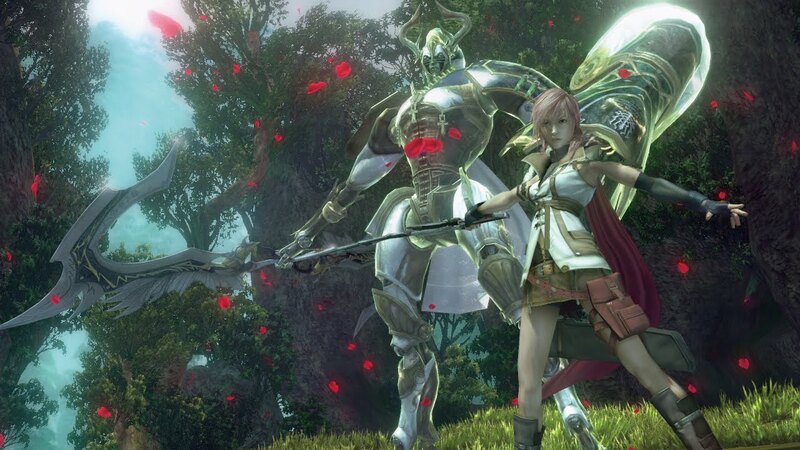 Final Fantasy XIII's world is one in which players are invited to lose themselves. However, after spending some time in that world, I cannot help but feel nostalgic for some of the older titles. With all of its hyper-realistic splendor, Final Fantasy XIII seems like a place that can exist without any help from the player. 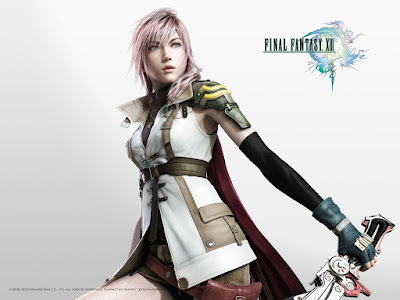 More than any other title in the series, Final Fantasy XIII is a ready-made universe that asks relatively little from its players in terms of imagination. Lightning is defined without much help from the player: her movements, appearance, and personality traits are shared across gameplay, cutscene, and artistic representations. A player wanting to fashion their own image of Lightning must struggle against a strongly-established version created by the developers. This stands in sharp contrast to Final Fantasy games that pre-date Final Fantasy VII. Because of a mixture of technical limitations and contemporaneous design philosophies, Terra's interactive form uses a traditional, "super deformed" art style. The oversized head and face lend themselves to representing the essence of emotions and mannerisms rather than attempting to simulate them. The game gives the player an impression of the character and leaves it to them to construct the particular details. The portrait suggests a different interpretation of Terra by using more realistic facial features and a subdued expression in juxtaposition to the cartoonish in-game representation. Since both of these versions exist in-game, the player learns that the game's aesthetic and characters are somewhat malleable. 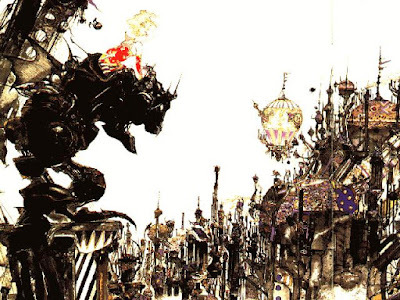 All three of these representations convey an important aspect of Final Fantasy VI's storytelling: the player is encouraged to use their imagination while exploring the narrative. The various kinds of artwork hint at a universe whose image is veiled; the game's form is a projection of something the player helps construct. In order to experience the world, we must imagine it as we would the setting of a novel or a campaign in a table top game. The sprites, portraits, and brushstrokes are all different yet valid ways of interpreting a universe whose existence relies on our interpretation. In contrast, Final Fantasy XIII's world is pre-packaged for the player's consumption. The gorgeous character designs leave little to the imagination: their voices, equipment, and personalities are rendered as beautiful, yet immutable, works of art. While Final Fantasy games have always been heavily authored experiences, Final Fantasy XIII defines the narrative experience in a way largely independent from player interpretation. The danger with this is that if a player does not like a character, there is little that can be done to change it. Examined in this way, the utility of simplistic or impressionistic graphics goes beyond technical limitations or a philosophical statement. Minimalism is a narrative tool that stimulates the player's imagination. 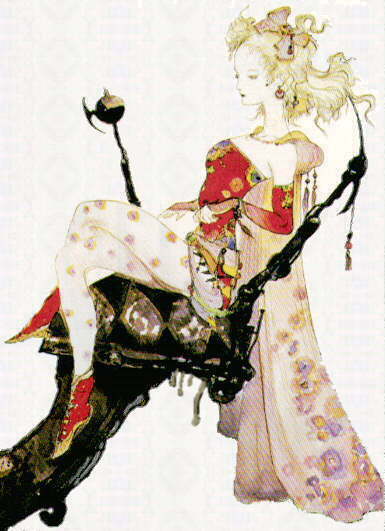 Every person's playthrough of Final Fantasy VI was slightly different based on how they conceived of its characters: Each person's Locke spoke differently, every person's Sabin was a different height, some imagined Terra as an ethereal water-color painting where others saw a manga caricature. The simplicity of crude graphical representations can reward a player's investment in the game: taking part in crafting the experience engenders a sense of ownership that facilitates immersion and enjoyment. 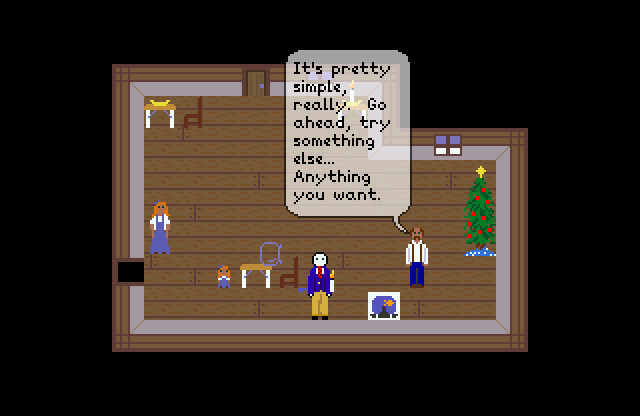 I suspect this is one of the reasons behind the retro aesthetic in the recently-released Sleep is Death: simple graphics are both technically flexible and narratively conducive to creating a tabula rasa for player-driven creation. Over the years, Final Fantasy has shifted the onus of storytelling away from the player and towards the developer. There is nothing inherently wrong with this, but it has changed the nature of the series. What was once a collection of sketches that comprised variations on a theme is now a single portrait. Make no mistake: Final Fantasy XIII it is a beautiful painting, but I do miss being able to add my own brushstrokes. When I first played Final Fantasy VI, for whatever reason, I imagined that Edgar had a beard. I also imagined that Cyan had no moustache. The sprites were small and vague enough that those were the dominant images in my head, even though the pause menu portraits were (obviously) completely different. I think pixel art does have a wonderful ability to be suggestive rather than explicit, and I think that suggestiveness has given pixel art a sort of timeless quality. The indie scene has obviously taken hold of pixel art, and mainstream releases like Mother 3 (the last major-release low-res game I played) also look great. I wonder if there's some way to embrace that suggestiveness with more 'modern' visuals. Games like Okami, etc. have gone down a more abstract route, and the MMO love is almost entirely abstract but perhaps too much so. I can't really think of a game with strong visual direction that still affords those 'personal brushstrokes' that you described above. Funny that you mentioned Cyan; I still don't think of him as mustachioed. Plus, I always imagined him as much younger than the portrait and art suggest. I've been trying to think of a modern game that offers something similar, but, as you point out, perhaps modern visuals just aren't conducive to it. I like the Okami example. Maybe Zelda: Wind Waker is another? It's not really as "customizable" as the pixel and sprite art, but it does have a timeless quality. Great point about malleability built into the mechanics rather than the aesthetics. Art is important, but I'd argue that the most important interpretations in video games come from the systems themselves. Final Fantasy VI basically let anyone learn any spell, but Final Fantasy IX and X seemed much more rigid in terms of ludic identity. Seems like Final Fantasy XIII is doing a good job at recapturing some of that customization. Don't forget the fidelity and control in the storytelling. FF games don't really take much player input in the story, so customizing the mechanics is one of the very few ways players can exert their will. Depth in the mechanics and customization is vital to making the FF games work as games instead of movies. X was pretty flexible... eventually. XII allowed more earlier, and I liked its character development more as a result. ...and another tangent, there are significant differences between combat choices and character development choices. Flexible combat need not require flexible character development and vice versa. Get them both, though, and you're doing well. I never played XII, but after hearing people talk about it I'm interested in it. It seems like it was a pretty bold departure in combat and player controlled elements in general.